How do you configure Read-Only Access Rights to a user group? To enable access control of Requirements within a project, the pre-requisite is that project security must be enabled. Next, Security Profiles must be created or modified to define the type of access (View, Create, Delete, Modify) granted in each Security Profile. Finally, Security Profiles are assigned to appropriate Groups. In short, access to requirements is controlled by security profiles assigned to user groups for each project. 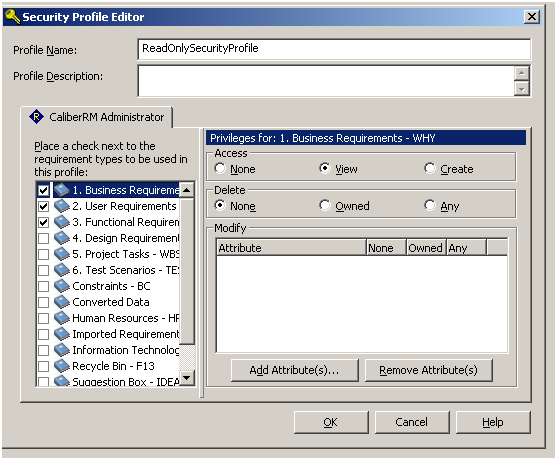 In the screenshot above, note that only 'View' access is granted for requirements under 'Business Requirements' type. Access right for Create, Delete or Modify is not granted. Repeat this for all requirement types that are enabled (checked). Next, the group of users that should have read-only access rights should be assigned to this security profile. The attached document illustrates the steps using an example (starting from the creation of a user group to the assignment of the security profile for that group).